Kira tries to figure out what to do with herself outside of Deep Space Nine as a civil war quickly escalates on Bajor. I love the argument between Odo and Kira at the beginning of this episode. 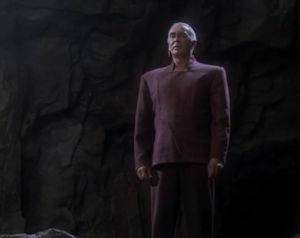 Odo yelling at her because she's letting herself be judged by the laws of others, even though Odo is, essentially, the arbiter of justice on the station. Odo projects on her when he tells her that she's supposed to follow her own moral code, and Kira calls him on it with the simple line, "I'll miss you too, Odo." Good writing. The scene in Kira's quarters where various people keep popping in is fun, but a tad too farcical. Bashir, in particular, is a little too comically obtuse. It's interesting that Quark is the first to realize that the trouble is getting so out of hand that it's time to go, and it's even more interesting that the first person he decides to tell is Odo. It's wise to bring Vedek Winn and Vedek Bareil back, given the escalating political situation, but it's odd that the story spends so much time trying to foist romance upon Bareil and Kira. As a bridge between the first and third parts of this arc, this episode serves its purpose, but doesn't quite have a coherent voice of its own. Kira's drawn out goodbyes and her time at the monastary drag the story down, but it picks up again in the final act when the stakes become clear. On one hand, the politics are similar to the Klingon Civil War arc from TNG's "Redemption," complete with the missing crewmember, but the stakes for Sisko and Deep Space Nine are more immediately relevant and Sisko chooses to handle it very differently than Picard probably would. The cliffhanger here, which is much easier to see coming, is Sisko's bold pronouncement that he intends to make a stand at the station, even if he has to bend against the orders of a Starfleet admiral and the Prime Directive. It's an awesome, blood-pumping cliffhanger, and it would have been a fantastic way to end the first season, had the writers been ready at the time.